The greatest changes to the otherwise flawless Contacts department concern two features we just take for granted on any other phone: (1) searching contacts via gradual typing in a search box and (2) importing contacts from the SIM card. Now seriously, how hard must it have been to add those in the first place? Another new feature is that the Contact list is now accessible via its own icon on the Home screen - you now longer need to go through the Phone app for that purpose. We enjoyed flawless reception with the iPhone 3G, but we only used it in urban areas with nice signal. Having had no issues with the iPhone 1G either, we guess that was to be expected. When it comes to call management however, we are really sorry Apple haven't added Smart Dialing to their virtual numpad - it's one of the greatest features of Windows Mobile and it's even making its way to feature phones lately, so it can't be that hard. Now back to our lab to test another parameter that was touted by Steve Jobs as "dramatically improved audio" - probably meaning the iPhone 3G loudspeaker would not be as lame as the iPhone 1G's. We tested a last-year's 1.1.1 iPhone 1G and this year's 1.1.4 iPhone 1G unit to compare them to the iPhone 3G. The 1G units performed equally in our test - they are still the quietest handsets we've tested so far. It turned out that the iPhone 3G is an underdog too - it outperformed the iPhone 1G in almost all tests but it's still stuck in the Below Average category. When you play music through the loudspeaker for example (the pink noise test) the difference to the iPhone 1G is so small you would hardly notice it. 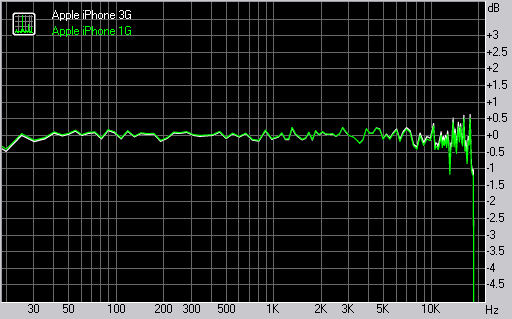 And it's even quieter than the 1G units in the Human Voice test, which practically means you still won't get decent in-call loudspeaker performance. But here are the results, so you can see for yourselves. You can find more information about the test itself and the whole list of tested devices here. There are no upgrades to the SMS department - we still don't have a way to forward messages or delete individual ones from the conversations. MMS is nowhere to be seen too. Apple however have put a lot of effort to email. You probably know that there's push email support now and MS Exchange support too. That's Apple's way of scratching the corporate itch, as well as an attempt to steal some market share from Blackberry. A strange prerequisite for using a MS Exchange account with the iPhone 3G is enabling your SIM card PIN prompt - we appreciate security, but that one we just don't understand. Now you can also mass delete and mass move emails around, but they still haven't found a way to search your emails or even sort them by any filter. You can save attached images straight to your Camera Album, but you still can't send full resolution images from your camera via email. Instead they get downsampled to 800 x 600 pixels. And there's still no support for ZIP or RAR files, so if you receive those, you won't be able to check their contents. Of course, DOC, PDF, XLS and PPT files which you receive as attachments can be previewed (no editing). When you open an office document, screen auto rotation kicks in and you can use multi-touch to zoom in/out. At least, landscape QWERTY mode is now available to messaging, and that feature is high on our list. There are no changes to the Multimedia department on the iPhone 3G whatsoever. Exploring photos, music and videos goes just as it did on the iPhone 1G. We were really curious however how the iPhone 3G fares in terms of audio quality. So we put it through its paces in our regular audio quality test. It turned out that the audio quality of the iPhone 3G is just as expected - flawless. The iPod pedigree is enough to provide one of the best sonic experiences on the market. All of the readings are remarkable, so we have an excellent performer in all possible aspects. As far as the difference to the iPhone 1G is concerned, the iPhone 3G performs almost the same as its predecessor. The differences are really insignificant and, as there was virtually nothing more to ask of the iPhone 1G, this spells great sound experience. Check out the comparative results. More information about the meaning of the different numbers and the whole testing process can be found here.